Posted on January 4, 2016 at 12:27 am. The new year is upon us, and what better way to welcome 2016 then with a chance at a share of over $30,000 at Leo Vegas casino. The King of Mobile casinos is offering players to battle it out in the $20,000 Nirvana Tournament, as well as offering a chance to win a $10,000 bet on their live dealer titles, an all expenses paid trip, and more. 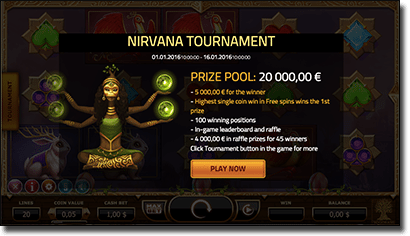 From now until January 16, players can play Nirvana for a shot at $20,000. The slot, featuring Wild Seeds, Mega Reel and Nudge Reels, was released by Yggdrasil last November and is available on both mobile and desktop devices. This tournament isn’t like other tournaments though, as it has the ability to be conducted within the game, rather than clicking back and forward between multiple pages. For example, if you are a regular player at Leo Vegas and have participated in their promotions you will have noticed the leaderboard is generally located on the promotions page. Since everything is in the slot, you will find the leaderboard located here too instead of the promotional page. So all you have to do is follow our links to www.LeoVegas.com and click on the 5 reel and 20 paylines slot by Yggdrasil and here you will be instructed as to how to participate. However, to win first place and pocket $5000, you need to be the first player to win the highest single coin win in the Free Spins feature. You can check the leaderboard by clicking on the tournament link on the side of the slot, as well as any other information about the contest including detailed rules. If pokies tournaments aren’t really your thing you can play an array of live dealer games at Leo Vegas and still have the chance to win incredible prizes. Up until January 20 players will receive a raffle ticket for ever $15 bet made on live dealer titles, including Live Blackjack, Live Roulette, Live Baccarat, etc. For every $15 bet you make you will earn a point, and with two leaderboards (for January 10 and January 20) available over the promotional period you have twice the chance to win. There are special live dealer titles where you can double your points for the leaderboard, including Immersive Live Roulette for the January 10 leaderboard, and Authentic Games for the January 20 leaderboard. Additionally, for every day you play, you will receive a raffle ticket into the draw. Here you can win an all expenses paid trip to a luxury hotel, as well as a $10,000 red or black bet on the Live Roulette title available at Leo Vegas. If you manage to win the red or black bet, you get to keep the winnings. The draw will take place on January 21, and all tickets are counted regardless the device you play on – smartphone, tablet, laptop or desktop. Leo Vegas online casino are really celebrating the New Year, so kick of 2016 the right way and follow our links to win some incredible prizes.